Turun Ursa r.y. is an amateur astronomers association located in Turku, Finland. 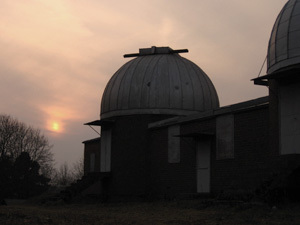 It provides its members facilities and equipment for amateur astronomy and organises public stargazing in Turku region. Stargazing evenings in Iso-Heikkilä observatory are on a summer break. We will be back at fall 2019. The active members still meet in Iso-Heikkilä observatory on Friday evenings for a chat and possibly some observing. Turun Ursa has two observatories: one in Iso-Heikkilä, Turku and one in Kevola, Paimio. Iso-Heikkilä's main telescope is 15 cm refractor and it's mainly used during the public stargazing shows. Kevola Observatory is located in the countryside, so it's more suitable for proper observations. Turun Ursa's portable Celestron NexStar 11 GPS reflector is mostly located there. Kevola is also currently under heavy renovation which will eventually transform the place into a modern and superbly equipped facility for amateur astronomy. Turun Ursa was established in 1928 and is one of the oldest amateur astronomers associations in Finland. It's first chairman was Prof. Yrjö Väisälä, who was a renowned Finnish astronomer and physicist. Prof. Väisälä chairmanned Turun Ursa until his death in 1971. The current Iso-Heikkilä Observatory was built in 1937 for the Turku University. When the light pollution so near the city grew, the University erected a new observatory in Tuorla in 1950s. Iso-Heikkilä was left to amateur astronomers and is still used in this fashion. Kevola Observatory was also originally built for University, but later slowly transformed for amateur use.